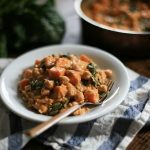 This filling chickpea and sweet potato stew has a unique blend of flavors that are a little tangy, a little sweet, and completely crave-worthy. 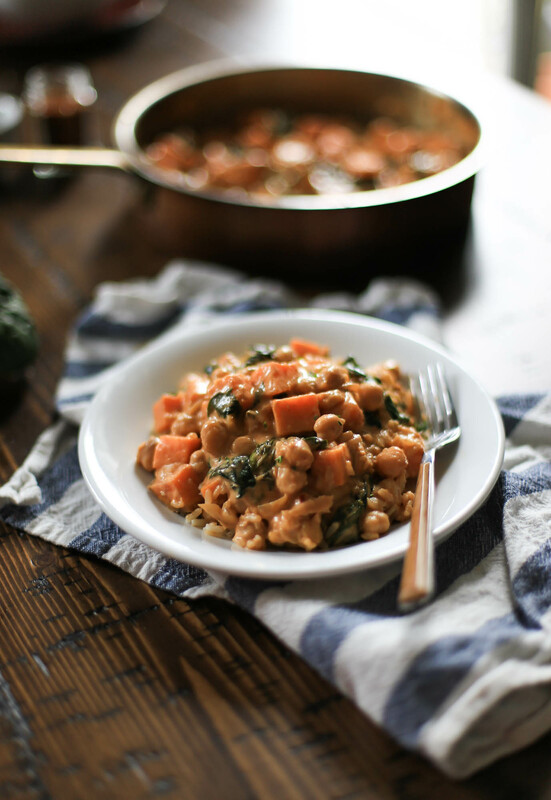 If ‘favorite leftovers’ was a real food category, this one pot dinner would be at the top of my list. I’ve lost track of how many times I’ve made this recipe, always cooking double the amount so I could enjoy it for lunch the following days. It’s a regular on our dinner rotation, along with this and this. A little ginger, garlic, lemon, and tomato sauce all lend a hand in flavoring the stew. The creamy, saucy dish can be served on its own, but I prefer it over rice or with naan. You can find coconut milk most likely in the international foods aisle (in cans). Sometimes the coconut milk separates in the can, with the cream at the top and water at the bottom. Totally normal, spoon it all into the pan. I usually buy regular, full-fat coconut milk; there really is no substitute for the ingredient in curry-like dishes such as this. Most of the time I refer to this recipe as curry, but stew is more technically correct since there is no curry paste or powder in the mixture. Added bonus: the stew can be frozen. Once you’re ready to enjoy, let it thaw overnight in the refrigerator and then heat on the stove over low heat. This provides yet more evidence to my mostly meatless eating habits. 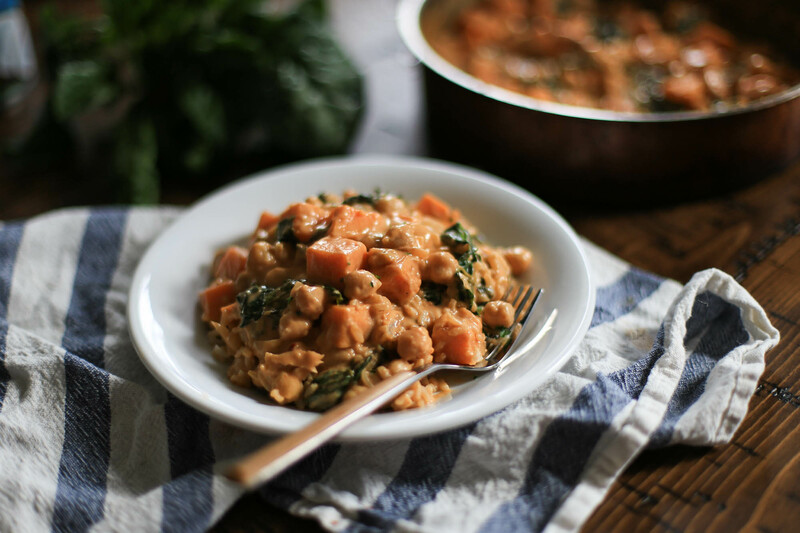 With the right ingredients, like protein-heavy chickpeas and fibrous sweet potatoes, you have a comforting, filling, well-rounded meal. Second added bonus: want to make your co-workers jealous with your awesome lunch? Go ahead and heat this up in the microwave, and be ready for some inquiries about a recipe. Heat the oil in a deep, large pan over medium heat. Add the onion and saute for 5 minutes. 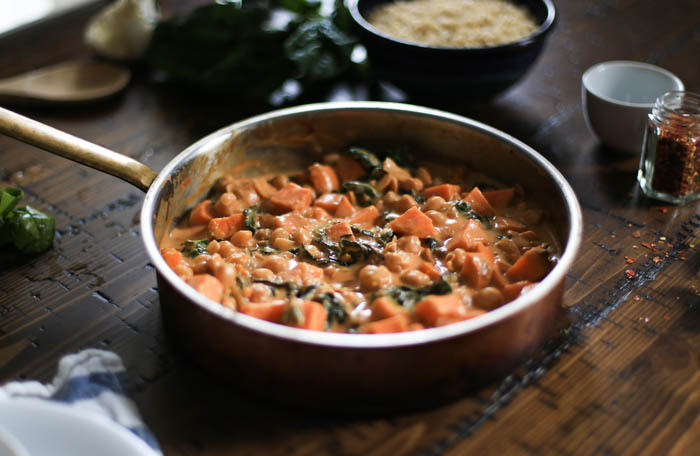 Stir in the sweet potatoes, cover, and cook for 7-8 minutes more - stirring regularly. Add the garlic, tomato paste, and red pepper flakes. Mix well and cook for 3 minutes. Mix in the drained chickpeas, stirring to coat with the tomato mixture, and cook for 4-5 minutes to slightly brown the chickpeas. One handful at a time, stir in the spinach to wilt. Once all of the spinach is added and slightly wilted, stir in the coconut milk, salt, ground ginger, and lemon juice. Bring the mixture to a simmer, then turn down the heat to low and cook for 10 -15 minutes, stirring occasionally. Adjust the salt and lemon juice to taste. The stew is ready when the sweet potatoes are fork-tender and the chickpeas are heated through. Serve warm over rice or quinoa. Double the recipe! Trust me, you'll want leftovers. The smaller the sweet potatoes are cut, the less time they will take to cook through.